At first glance, this book’s title conjures up an incongruous image of Fernand Braudel in epaulettes. Military history, until comparatively recently, lived by the detailed narrative that Braudel deemed the least fascinating literary form in the study of history. The linear unfolding of events was for Braudel, observed Jacques LeGoff, “an atrophied appendix” hitched unharmoniously to the magisterial substance of the longue duree. The editors are quick to cite Braudel’s concession that warfare profoundly permeated human life in the Mediterranean. But, the Annalistes had bigger fish to fry. This historical conundrum, the reconciliation of military history with conceptually bold post-Braudelian scholarship, is the anthology’s starting point. Historical problems raised by Braudel have been tackled, indeed synthesized, by military historians, sometimes with remarkable results. Geoffrey Parker, doubtless on occasion sharing drinks (as a young man) with J.H. Plumb and other Cambridge dons, realized political history might intersect with Braudel’s “problem of distance.” Indeed, Braudel had made brief and tantalizing reference to the tortuous military corridor traversed by Catholic armies recruited in Iberia and other Mediterranean climes in order to serve against Protestant rebels in the Low Countries. The result was 1972’s The Army of Flanders and the Spanish Road, published (fittingly) by Cambridge University Press, a book that could be ignored neither by Annalistes nor Oxbridge dons enamored with narrative. Parker’s later and equally formidable constructions of military history sometime obscure just how original was the PhD dissertation that served as the basis for his first book (which contained, literally, his unpublished and earliest thoughts on a revisionism of the Roberts thesis). So, though the ground chosen by Theotokis and Yıldız is treacherous, it is also fertile. The editors align their military history first with the Braudelian vision, and then with more recent interpretations of Mediterranean history such as the “ecologizing” approach, the “interactionist” approach that spawned the “Mediterranean unity” interpretation, John Pryor’s emphasis on the technical challenges of navigation and the forces of nature, Rhoads Murphey’s underscoring unpredictability and “human elements”, and Stephen Morillo’s broadening of the definition of military history (1-6). These perspectives are grouped into five thematic sections that possess internally a fair measure of topical and chronological integration: naval activity, weapons and armor, strategy and command, military literature, and military roles within society (all being categories that fall within Morillo’s revisionist definition of military history). The contributors cast a wide net, even when discussing subjects that might seem arcane to the non-specialist. Thus A Military History of the Mediterranean Sea is not a comprehensive, multi-volume set explicative of the ebb and flow of narrative history. No Victorians survive who might hazard such an ambitious work. Rather, the editors propose a “vertical” history complementing Braudel’s “horizontal” magnum opus. By “vertical” the editors mean to examine “the changing face of several of war’s aspects and contexts” (2) from the collapse of Roman stability to the chaos of the early modern world. The book’s Braudelian-Parkerian synthesis is most apparent in Alan Murray’s explanation of the Crusaders’ early preference for overland travel to the Holy Land, with passages by sea gradually being attempted into the late 1100s. The author asserts that the Fourth Crusade then marked “a fundamental change in the aims and logistics of crusading” (196). Murray’s essay shows how Braudelian problems of distance, with their contours of topography and seascape, channeled human activity. Murray also establishes how human political goals, manifested in Crusader strategies, needed to be tempered by what was possible not only within the geographical context but also organizationally and institutionally. Where were ports available and could those havens be held? Was there a sufficient financial base (e.g. in the case of Venice, taxation systems and available revenues) to construct sufficient galleys to execute amphibious landings? How could Europeans anticipate the ever-changing Islamic military and political map, for example when “Saladin’s conquests in 1187 brought large sections of the Syrian and Palestinian littoral under enemy control” (196)? Murray’s synoptic portrait shows why many historians are turning their attention to the interface of land and sea: amphibious warfare. As this reviewer has argued elsewhere, one feature of pre-industrial age amphibious warfare was its complex intimacy with commercial conflicts and the pursuit and defense of riches. Cornel Bontea’s contribution, with its delineation between passagium generale and passagium patriculare, expounds upon the feasibility of both strategies given the Braudelian realities faced by fourteenth century Crusaders. The passagium generale, promulgated by the Papacy, envisioned a macrocosmic collaboration among powers of the Latin West characterized by fiscal as well as military preparations dedicated to seizing the Holy Land. The passaggium particulare focused upon a more microcosmic strategic enterprise, relying in part upon economics to soften the resolve and capabilities of Islamic adversaries. What Bontea finds remarkable is the Latins’ inability to comprehend how reality could not approximate their ideal in the medieval Mediterranean. As he puts it, “. . . no matter how fourteenth century theorists conceptualized their actions, their approach was highly optimistic and hardly feasible considering the logistics of the era” (203). Using the approach of John Pryor mentioned above, Bontea gets down to brass tacks. Fourteenth century galleys, like their later counterparts, could be swamped, had difficulty overtaking larger vessels under sail, struggled to operate in bad weather (such as in winter). The limitations of galleys are well known. Furthermore, they weren’t numerous enough to fulfill the designs of either passagium. The medieval military mind appears to have been unable to grasp the Braudelian problem of distance. Elina Gugliuzzo, noting that Ottoman naval achievements have been underestimated, manages to summarize in roughly ten pages how shifting geopolitical realities prompted the precipitous ascendancy of Ottoman seapower. Gugliuzzo explains succinctly how an “inclusive” (82) multicultural Mediterranean “microecologies” (80) enabled the Sultan’s administrators to transform a great land power into a seagoing empire within a generation. Similarly, Wayne Bowen applies quite pithily the interactionist approach in order to generalize about relations between the Spanish and Ottoman navies over a period of nearly a half millennium. A common denominator among these eighteen essays is the intensity of interaction among adversaries in the Mediterranean. Gugliuzzo’s invocation of cultural mediation and her citation of Mary Louise Pratt’s “contact zones” (79) are evident in what the anthology’s contributions reveal. The steady flow of communication (and commodities) throughout the Mediterranean matched the restlessness of the sea itself. Characteristic of the imaginative use of sources found in this volume is Raffaele D’Amato’s visually-impressive exposition on the Deir Abou Hennis frescoes. Twenty-two colored figures unfold a range of material culture mustered as evidence in utilizing military iconography. D’Amato’s thorough exploitation of artworks in stone, wood, ivory, and paint, coupled with artifacts of textile, metal, and other materials, empower him to prove the accuracy and veracity of sixth and seventh century A.D. representations of the Roman military. A demonstration of multidisciplinary scholarship, D’Amato’s tour-de-force is representative of the originality and ability of the academic work found herein. One must acknowledge Brill’s production values, too, for the insertion of full-color illustrations within text. Brill continues to promote, and enhance, pictorial scholarship such as that of Raffaele D’Amato. Also illuminating is the essay by Chrysovalantis Papadamou, employing an interactionist approach through the uncovering and dissecting of Mediterranean espionage, with specific reference to Venetian Corfu and the building of the San Marco Fortress. Sixteenth-century fortifications underwent bewildering innovations and adaptions, especially those edifices captured and retrofitted, modifications that intrigued enemies and prompted close observation. Intelligence gathering is an aspect of the “military revolution” deserving greater research, and Papadamou’s digging in the Archivio di Stato di Venezia reveals the human web that Ottomanists such as Rhoads Murphey and Daniel Goffman have depicted. Papadamou’s offering (in which soldiers served as spies, sometimes with fatal results) raises the issue of military personnel assuming more than one social and political role. In the last section, Part Five, one finds three like-minded essays resonating Papadamou. Jacopo Pessina, drawing in part from the historiography of Tudor and Stuart England, shows how early-modern European militias differed. Much has been made of civic humanism and political engagement as reflected in the social status of militiamen. In England the propertied classes reinforced their privileges and escaped involuntary military service overseas through membership in the “trained bands” (the actively exercised and equipped militiamen) whereas the propertyless lay vulnerable to impressment for foreign expeditions. Pessina finds a contrary situation in Italy, where the propertyless vied for some measure of status and security by mustering. Only in the seventeenth century do elites gravitate toward militia service. The anthology’s last two essays, including Pessina’s above-described contribution, proffer useful quantitative data. Pessina has tabulated a dozen pie graphs illustrating the social status of militia officers and militiamen, taking into account tax assessment as well. Additionally, four tables elucidate longitudinally the graphs by identifying weapons borne, rank, and political involvement. Editor Aysa Yıldız compiles a prosopographical analysis of the “promotion patterns” of the Janissaries’ “command system” (17). She differentiates three periods within the years 1515 to 1826. Then, Yıldız documents her assertions with detailed and individualized tables of the Janissary ağas according to career, appointment and dismissal dates (400-426), reinforced with graphs on career distribution (431, 440, 453) and length of service (445-446). Her database and analysis constitute a wealth of information on a unique military institution. Because her data spans centuries Yıldız is able to track the oscillations of (and within) this military stratum in relation to Ottoman society and those institutions at the disposal of the Sultan. One risks committing a disservice by not detailing all eighteen engrossing essays that are bound within this anthology. The reviewer apologizes to the contributors for attempting to evaluate this collection in 2500 words, leaving some works described only briefly. Tilemachos Lounghis sets the stage with a synopsis encompassing 800-years, describing how the Byzantines applied seapower. Lilia Campana sheds light on the role of technological innovation, and how a solitary individual could affect the trajectory of an imperial Mediterranean power, in this case Venice. Georgios Theotokis pauses in his editorial duties to investigate weaponry, the Byzantine use of the lasso. Iason Tzouriadis, in tandem with Raffaele D’Amatao’s preceding contribution, shows how iconography enriches military history. Like Theotokis, Tzouriadis rescues a subject too often dismissed as “antiquarian”, the study of the tools of war, and contextualizes staff weapons rightly as useful specimens of material culture. Stephen Bennett presents more than a study in command; he offers insights into the thinking of the protagonists at the Battle of Acre, especially Guy of Lusignan. One cannot help but be exhausted by the tedious introductions to the “new” military history that bemoan battle history. Bennett’s contribution provides an appropriate retort to such snobbery, as does amplification of siege warfare in this anthology. Ian Wilson, building upon pioneering work by Randall Rogers, widens appreciation of the many facets of siege warfare by exploring the more nuanced roles of diplomacy and negotiation in siegecraft. Part Four of the anthology, dedicated to military literature, has so far been neglected in this review. Consistent with the editors’ advocacy of incorporating all types of evidence to document the early history of the Mediterranean, a trio of scholars dissects Byzantine treatises because, in the editors’ words, “these manuals were a conscious adaptation to the geopolitical realities of the day and they encouraged improvisation in the battlefield rather than passing on obsolete battle-tactics” (14). Philip Rance, enmeshed deeply in editing the Taktika of Ouranos, brings to our attention certain Topkapı Palace Library manuscripts, including as an appendix Manuel Philes’ prefatory epigram on the military treatise of Michael Doukis Glabas Tarchaneiotes in Greek and English translation. 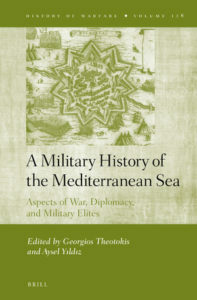 Nikolaos Kanellopoulos finds a “confluence of Eastern and Western military tradition” in the treatises of Theodore Palaiologos “that incorporates the experience of both worlds” (295). Savvas Kyriakidis gives voice to “the only late Byzantine emperor who wrote a narrative of the political and military events of his period” (299). Stathis Birtachas supplements our understanding of Venetian military organization advanced by Michael Mallett and Sir John Hale by expounding upon how mercenary auxiliaries played diverse roles in Venetian territories. In summation, Theotokis’ productivity and range continue to amaze as he sweeps through the eastern Mediterranean. Yıldız defies simple categorization; she is as much a social historian as a military historian, and personifies the “war and society” historiographical approach. Mentioning the ethnicity of the editors and contributors might seem unusual or even ill-advised. However, this anthology underscores the relevance of cultural cross-pollenization in the Mediterranean. And the authors match their subject matter on that count of cultural mediation. The current political and economic predicament of the Republic of Greece, coincident with recent political and constitutional rearrangements in the Republic of Turkey, present serious concerns for foreign academicians interested in (and admiring of) those nations, their peoples, and their respective contributions to global civilization. The heirs of the Byzantine and Ottoman Empires deserve better than what they have got presently. What an inspiration, therefore, is the appearance of a first-rate collaborative effort between two rising stars in academe, one Greek and the other Turkish, who have recruited such a diversity of scholarly talent (a mirror of the multiform Mediterranean they present). The editors appear to have motivated the contributors to draw broad yet informed conclusions, and to take risks. Many of these essays are penned by historians who are in the early stages of their careers. These comparatively new voices need to be heard by wider audiences than exclusively the specialists they attract when delivering conference papers. There is much that is strikingly original here, not just the research itself but also the volume’s synergy, and for that and many other reasons the editors deserve accolades.